BABY NATURA 3PC ORGANIC CRIB SET BRAND NEW WINNIPEG FURNITURE STORE The 3 piece Organic Crib Set furnishes a pristine, organic sleep environment to nurture your most precious resource. An eco-chic nursery as easy as 1, 2, 3. 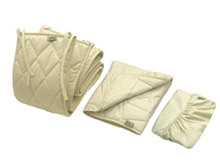 The 3 piece Organic Crib Set furnishes a pristine, organic sleep environment to nurture your most precious resource. An eco-chic nursery as easy as 1, 2, 3. The 3 piece Organic Crib Set puts health first with 100% certified organic goodness for your own little miracle of nature. Shelter your baby in the comfort of all-natural cotton, free from chemicals, dyes and allergens that can irritate sensitive skin. Organic, unbleached cotton sateen and 100% organic cotton fill, you know your baby is sleeping in an all natural, nighttime eco-system. Now that’s the stuff dreams are made of, right?